Can you learn respect through sports? 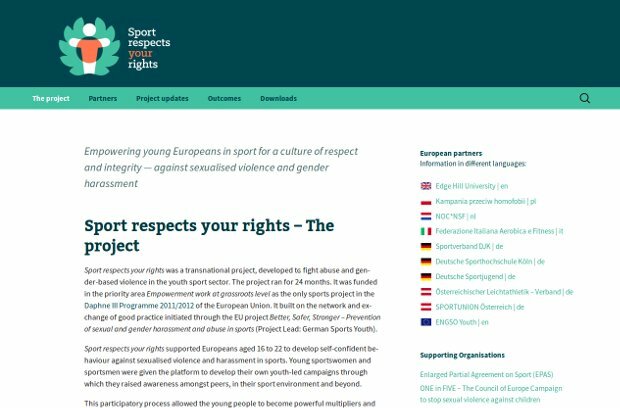 Sport respects your rights was a transnational project, developed to fight abuse and gender-based violence in the youth sport sector. The project ran for 24 months. It was funded in the priority area Empowerment work at grassroots level as the only sports project in the Daphne III Programme 2011/2012 of the European Union. It built on the network and exchange of good practice initiated through the EU project Better, Safer, Stronger – Prevention of sexual and gender harassment and abuse in sports. Sport respects your rights supported Europeans aged 16 to 22 to develop self-confident behaviour against sexualised violence and harassment in sports. Young sportswomen and sportsmen were given the platform to develop their own youth-led campaigns through which they raised awareness amongst peers, in their sport environment and beyond. This participatory process allowed the young people to become powerful multipliers and active agents of social change in their settings. Parallel to the educational youth work, each project partner developed a multi-sector network in order to create long-lasting synergies to fight violence and harassment in sport. Direct education and sensitisation of the target group and intermediaries in the participating organisations was devised through a multi-tier process. The aim was to encourage a self-perpetuating, multiplying effect in the sport sector through empowering the target group, 16 to 22 year old Europeans.